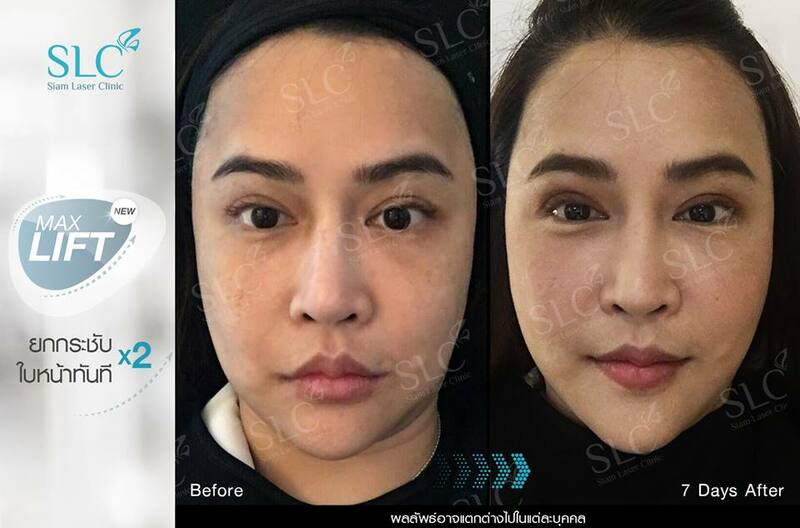 "Thread Lift” is a popular medical procedure that is recognized to be able to fix the problems of sagging skin, lift skin, revitalize skin texture, reduce wrinkles, and improve undefined facial contours, without surgery. The thread-lifting technique is to insert special threads, used in medical procedures, into tissue underneath the skin to stimulate the production of new collagen around the threads. As a result, the skin will be tightened and lifted. In addition, it enhances blood supply to the threaded skin area, making you look younger. Each type of threads used by SLC has been researched and developed under the care of a doctor team from Korea with expertise in lifting threads. Thus, not only are our threads highly efficient, but the most importance at SLC is that our doctor team is also skillful and experienced in thread lifting to ensure the most effective outcomes. 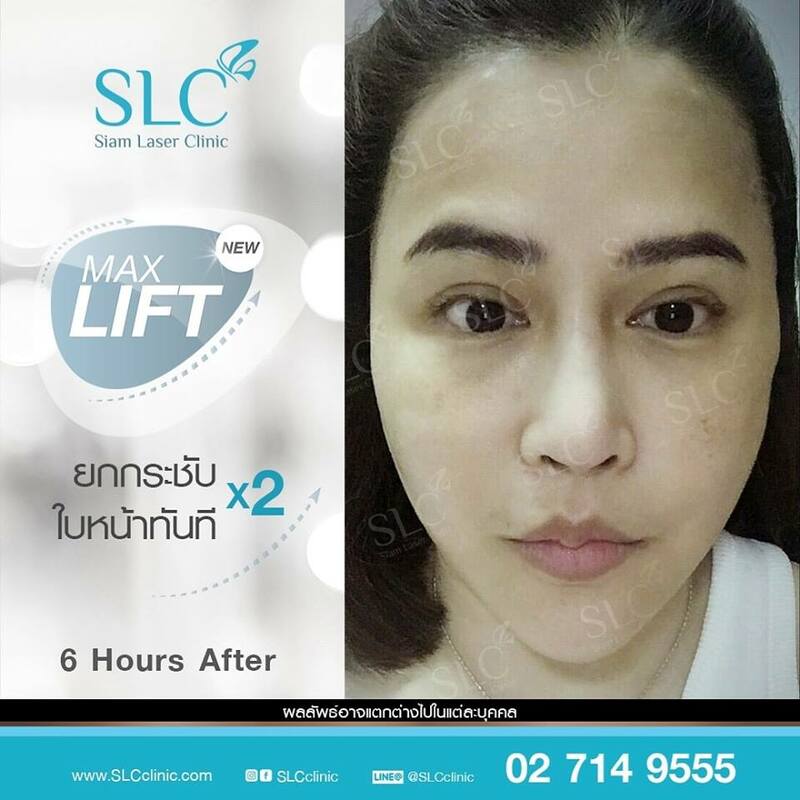 New Max Lift: Continually researched and developed in Korea in the field of facial re-structured surgery, the thread is made of Poly-L-Lactic Acid (PLLA) popularly used by cosmetic surgeons in Europe and America. 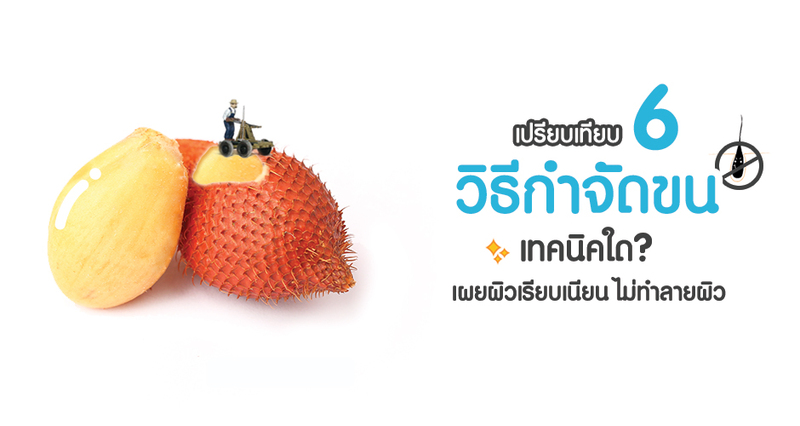 The PLLA is produced from Alpha-Hydroxy Acids (AHA) extracted from plants. The thread dissolves into carbon dioxide (CO2), water (H2O), and lactic acid within 18 months with no harm to the body. The result will last for 25 months. The thread features, especially the barb, are designed and developed, to be strong, endurable, especially sharp, well-arranged, and efficiently adhesive. The lifting competency is 8 folds better than the PDO thread. In addition, the thread has special property that stimulates collagen formation, softens and moisturizes skin, reduces wrinkles, and naturally brightens skin. It is suitable for people with facial and neck problems, such as sagging skin, fat deposit under the chin, cheek wrinkles, and any problematic areas on the face. 360 Brow Lift: The premium thread is the best thread available today. It is continually researched and developed in Korea in the field of facial re-structured surgery. The thread is made of Poly-L-Lactic Acid (PLLA) popularly used by cosmetic surgeons in Europe and America. The PLLA is produced from Alpha-Hydroxy Acids (AHA) extracted from plants. The thread dissolves into carbon dioxide (CO2), water (H2O), and lactic acid within 18 months but the result lasts for 25 months. Therefore, it does not leave hazardous residues and is safe to the body. With special design and unique production process, particularly the 360-degree twist and zigzag around the thread which improve the adhesive efficiency and can lift the skin equivalent to facelift surgery, the thread is suitable for use in delicate areas or small areas of skin, with no visible lifted threads and no tissue effects or indentation at the lifted areas. In addition, it has the special property to stimulate collagen formation around the threads and moisturize and naturally brighten the skin. It is recommended for people with problems of lax eyebrows, ptotic outer-canthus, ptotic eyebrow end, or any problematic areas on the face. Supper Lock: The PDO (Polydioxanone) thread, regularly used in cardiac surgery, is highly safe, rarely causes allergies, and does not trigger skin reactions because it is naturally dissolvable and receives safety certificates from national and international FDA. The PDO thread dissolves within 6 months but the result will last for 24 months. The thread can adhere to the skin layer to lift the sagging skin and promote collagen formation around the thread, resulting in naturally moisturized and glowing skin. This thread lift can be performed on the whole face or specific areas of the face. Fix the problems of sagging skin without surgery. Moisturize and naturally brighten skin. Rejuvenate facial skin for younger looking. The procedure takes approximately 30-40 minutes, depending on the lifted area. Do not apply cream or make-up on the face for 1-2 days. Do not massage heavily over the threaded area for approximately 2 months. Do not drink alcohol within 24 hours after the treatment. Apply a cold pack to the threaded area immediately after the treatment.